Lesion overlap of vmPFC-lesioned patients. Color indicates the number of overlapping lesions at each voxel. For axial and coronal views, the left side of the brain is displayed on the right. 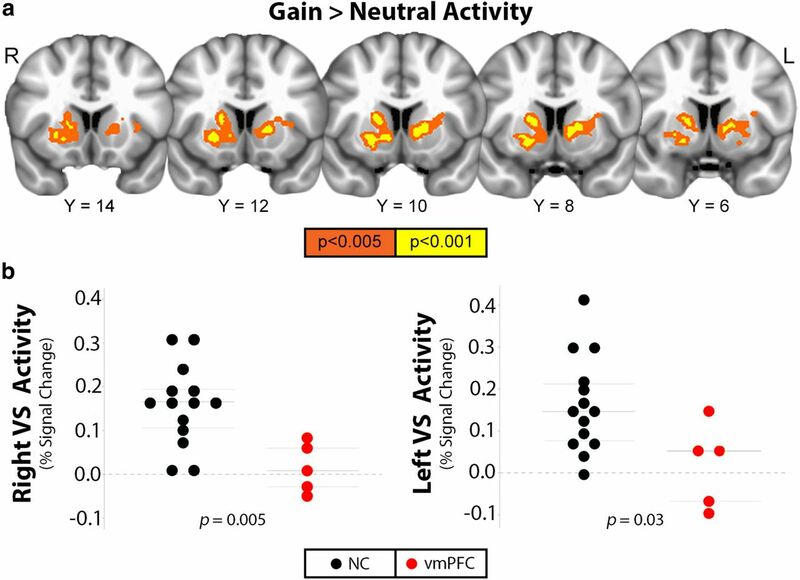 a, Striatal regions with greater activation to gain, relative to neutral, cues in 14 NC subjects. Significant striatum clusters from the gain > neutral contrast at p < 0.005 uncorrected in orange and p < 0.001 in yellow (pFWE < 0.05) for display. Slice coordinates (in millimeters) are presented in MNI template space. b, Plots depict the distribution of individual PSC values for vmPFC-lesioned patients (red circles) and NC subjects (black circles) in response to gain (+5, +1) minus neutral (+0) cues within each striatum cluster at p < 0.001 uncorrected, pFWE < 0.05. Light gray horizontal lines on the plots represent the mean and the first and third quartiles of PSC values for each group. a, Accumbens area (ventral striatum) subregions of a representative subject. 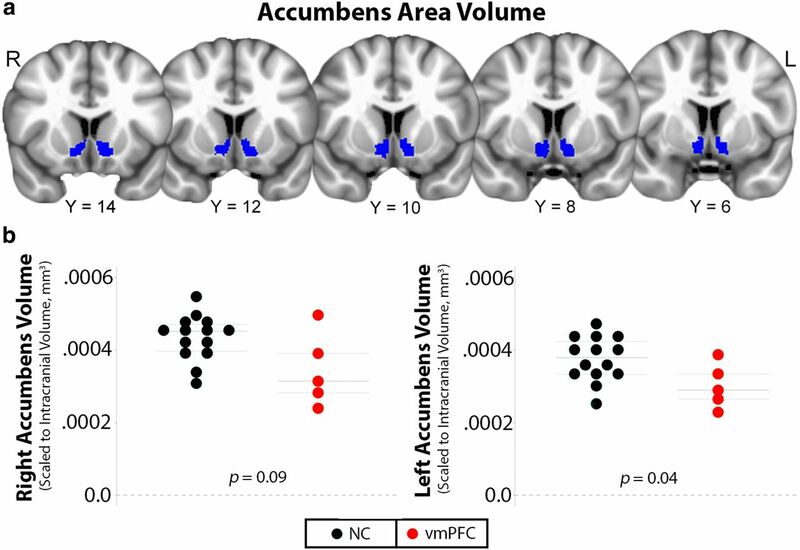 b, Plots depict the distribution of individual volume values (in cubic millimeters) for vmPFC-lesioned patients (red circles) and NC subjects (black circles) for each accumbens area region of interest, scaled to total estimated intracranial volume. Light gray horizontal lines on the plots represent the mean and the first and third quartiles of volume values for each group. Means are presented with SDs in parentheses. Edu, Years of education; IQ, intelligence quotient estimated by the Wide Range Achievement Test 4, Blue Reading subtest (Wilkinson and Robertson, 2006); BIS/BAS, scores from the Behavioral Inhibition System/Behavioral Approach System, with subtests for drive (D), fun seeking (FS), and reward responsiveness (RR) (Carver and White, 1994); Pos/Neg Aff, scores from the Positive and Negative Affect Schedule (Watson et al., 1988); BDI-II, Beck Depression Inventory-II (Beck et al., 1996); STAI-T, trait version of the Spielberger State Trait Anxiety Inventory (Spielberger et al., 1983). 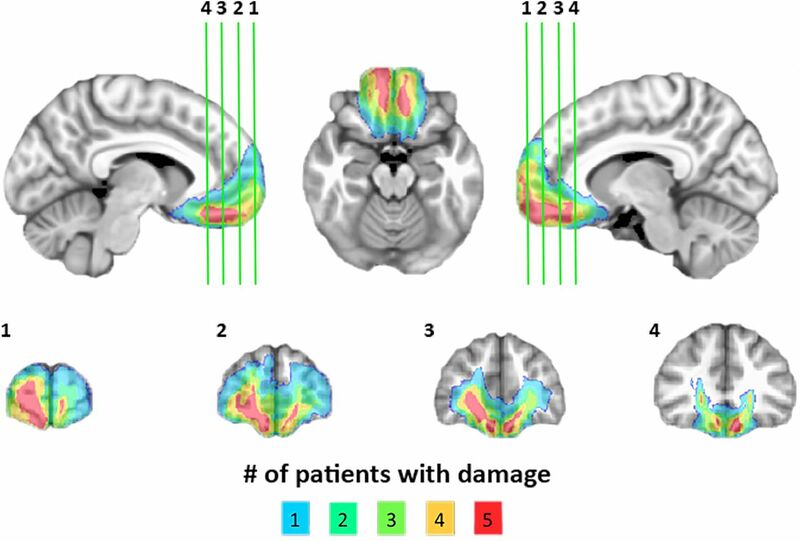 A recently published study from our laboratory (Pujara et al., 2015) demonstrates abnormal value-based decision-making in the same sample of vmPFC-lesioned patients who participated in the current study. Note that, because of a computer malfunction, the behavioral data for one NC subject was not available. Cluster size in number of voxels (3 × 3 × 3 mm3). Corrected p thresholds indicate minimum FWE-corrected p value for each cluster. Peak voxel coordinates (millimeters) are presented in MNI space. BA, Brodmann area; L, left; R, right. Significant group differences are in bold. L, Left; R, right; NAc, nucleus accumbens; ICV, intracranial volume.